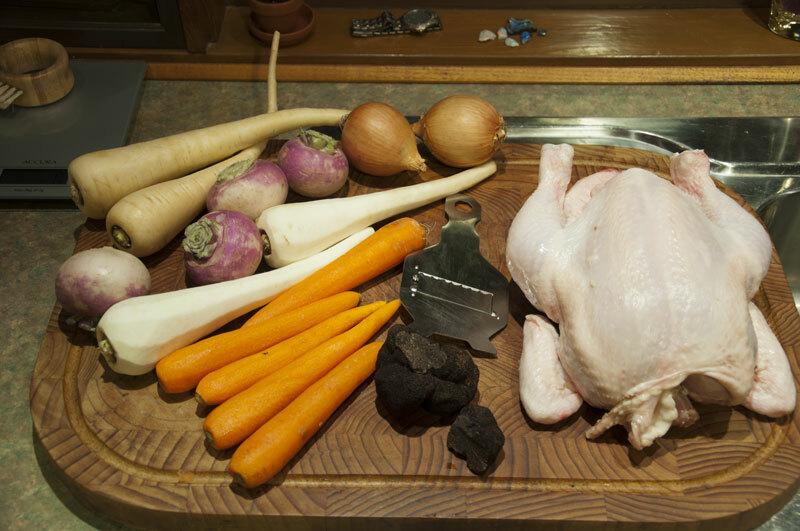 Yarra Valley Truffles: Recipe -Chicken in half mourning, "Poulet Demi Deuil"
Essentially we cook a chicken with black truffle under the skin, in a vegetable stock, then remove chicken and serve with the vegetables pureed. A nice benefit is most of the fat in the bird ends up on top of the stock, with a grease free chicken on the plate. 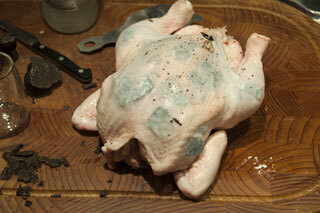 Clean the chicken and then work fingers under the breast skin until it is fully lifted. 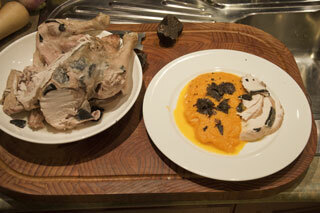 Be careful to not tear the skin, as it both holds the truffle against the meat and captures the flavour. Slice the truffle into ~2mm thick slices (reserve a little for final garnish), and slide them over the breast of the chicken, underneath the skin. I like to also add a pinch of salt with the truffle, and if the breast skin is lean, a little fat from elsewhere on the bird. I also lightly score the breast meat with a knife. Rub inside the cavity with half a teaspoon of salt and a little pepper, place a sprig of Thyme inside and close the skin with a skewer. Place the vegetables and chicken in a stockpot, add the remaining Thyme and a little salt, bring to boil, then simmer for about 75 minutes, until the thigh juices run clear when pierced. Serve the pureed vegetables with the carved chicken on top (or along side) and if desired a few shavings of fresh truffle to contrast with the cooked truffle on the carved meat. Skim the fat from the remaining stock, return the carcass to the liquid and prepare a chicken stock for (a risotto) the following night. Infuse parmesan cheese with truffle tonight for a superb risotto tomorrow.